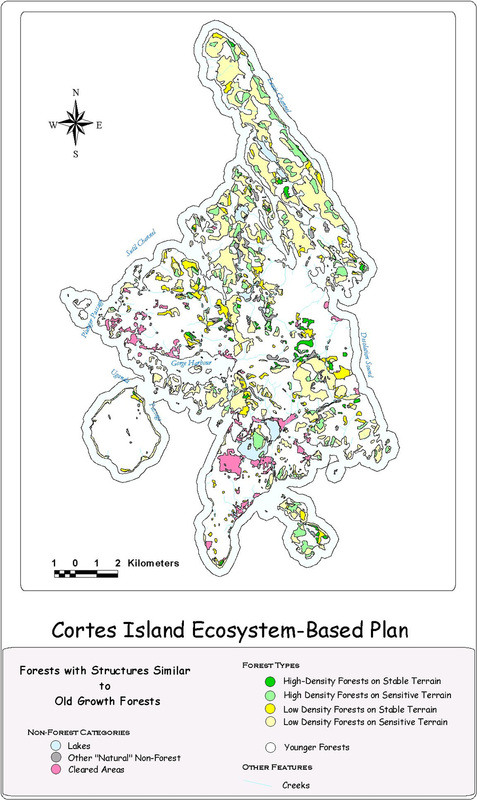 The Cortes Island ecosystem-based plan was prepared for the Cortes Island Forest Committee (CIFC). Cortes Island is at the north end of the Strait of Georgia, due east of Campbell River, British Columbia (see map below). The island is about 25 km long, 13 km wide, (at the longest and widest points, respectively) and 13,000 hectares (130 square kilometers) in area. It is home to 952 permanent residents (1996 census). Cortes Island is part of the Klahoose First Nation’d territory. 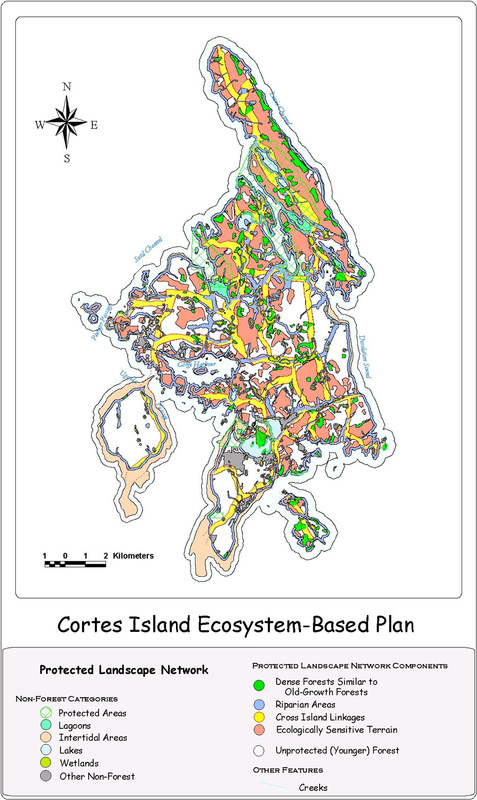 The Klahoose and the CIFC have a memorandum of agreement to work together to manage Cortes Island using an ecosystem-based approach, through an ecosystem-based forest management plan. 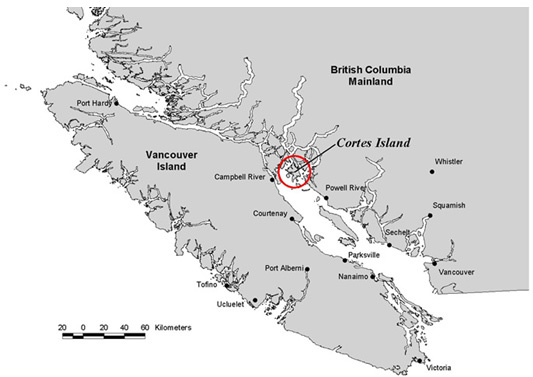 Location of Cortes Island within southwestern British Columbia, Canada. 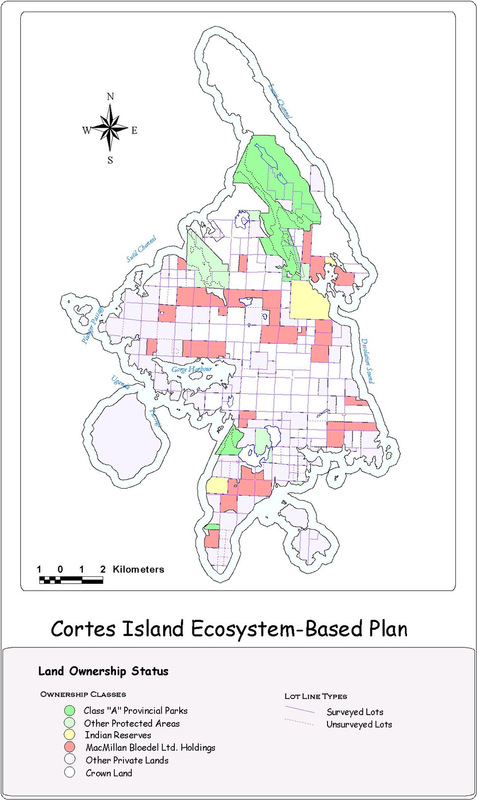 This is an initial ecosystem-based plan; some desirable analysis topics are yet to be completed (such as a history of logging disturbance on the island) and some analyses may need to be modified or improved over time as additional community input is received. This project was carried out using funds contributed by both the Cortes Island Forest Committee and the Silva Forest Foundation. Planning human uses on the remaining landbase of stable and moderately stable terrain is left to the community and their existing Cortes Official Community Plan. Silva ESD ratings are based on combinations of soil depth, slope gradient, soil moisture, and terrain complexity. This data layer is derived through a combination of aerial photo interpretation and GIS modeling. The Ecological Sensitivity to Disturbance (ESD) classes are delineated on 1:17,000 black and white air photos, and then imported into the GIS. ES1 and/or ES 7 areas are riparian ecosystems predominantly located in valley bottom areas, or near lakes. Only larger riparian ecosystems or wetland complexes were identified on air photos, and computer generated buffers around wetlands and streams were added in later steps. ES 2 terrain includes all areas with slopes greater than 60% gradient. Such slopes are unstable and prone to landslides and other forms of erosion, especially after logging and road construction. ES 4 sites are areas which are dissected by gullies or which contain convoluted, hilly and/or broken terrain. The combinations or small steep slopes, dry sites, and areas of shallow soil make these sites unsuitable for timber management. ES 5 sites have soil less than 50 cm deep over bedrock. MS or Moderately Stable sites are "in between" ES terrain and Stable terrain, with slopes in the 30 to 60% range. We excluded 75% of this class from the potential timber management landbase to allow for the presence of ecologically sensitive areas that are expected to be found when areas are field surveyed. S or Stable sites are areas with moderate slopes, deep well drained soils and even terrain. We included 100% of the forested area of S terrain in the potential timber management landbase. rocky knolls and ridges are common in elevated parts of the island. streams and creeks are difficult or impossible to see on the air photos because of dense vegetation. the 1:17,000 air photos understate ground slope, leading to a tendency to underestimate slope steepness and ecological sensitivity. The southern Cortes Island landscape has been extensively impacted by past logging. The scattered old-growth Douglas-fir trees that now stand like sentinels in small groups were once average sized trees in a continuous blanket of old-growth forest. While the lush second- and third-growth forests on Cortes are beautiful, they are ecologically very different from the old-growth fir, cedar and hemlock forests that they have replaced. Unless management plans are implemented to restore old-growth composition and structure to all forest types, the magnitude of the negative ecological changes will increase over time. These changes include loss of soil fertility, water quality, and biological diversity. High Density Old Growth: Areas with more than 10 stems per hectare of old-growth trees. Generally, these are intact stands which have not been logged. High density old growth is rare in the more settled portions on the island, but becomes more common moving onto the central spine of the island and up onto Von Donop peninsula. These areas are proposed for protection. Low Density Old Growth: Areas with less than 10 stems per hectare of old-growth trees. Generally, these are logged areas or rocky, sensitive sites with a few scattered old-growth trees. Low density old-growth forests on stable and moderately stable terrain remain in the potential timber management landbase, with the caveat that any logging activity in the area must not impact the stems or roots of the large old trees. This will likely require buffer zones around all individual trees. Following SFF’s analysis of old-growth forests, David Shipway of the CIFC then performed further photo interpretation and extensive field inspection of the photo interpreted old-growth stands. Changes from his work were incorporated into the database. We believe that old-growth forests once dominated the landscape of Cortes Island. However, extensive logging and resulting settlement-related fires around 80 to 100 years ago have greatly reduced the area of remaining old growth. Currently, only 6% of Cortes Island is occupied by high density old-growth forests, and a further 23% falls within the low density class. The low density old-growth class is not "old-growth forest", but is generally a natural open area or logged area which contains some large old-growth structures. While ecologically valuable, low density old-growth areas are not an ecological substitute for full canopy, old-growth forests on good growing sites. Because there is so little old growth left on Cortes Island, all remaining high density old-growth forests on Cortes Island need to be protected from timber cutting and other activities that significantly alter their composition, structure, and function. The current old-growth forests will be supplemented over time by old-growth stands which develop within the protected landscape network. This process will take at least another century, but there is no way to speed up the creation of old-growth forests. MacMillan Bloedel holdings were mapped from a 1974 map provided by the CIFC entitled Managed Forest Land - MacMillan Bloedel, which was drawn by the Regional District of Comox Strathcona Planning Department. The forest cover data mapping of other private land was updated in several locations per CIFC instructions. The boundaries of existing Class "A" Provincial Parks (Von Donop Marine Park and Manson’s Landing Park) were digitized from map and written information provided by Rik Simmons of the Ministry of Environment Lands and Parks, Strathcona District. The boundaries of the proposed Carrington Bay Park were digitized from a map provided by Alison Mewett of the Regional District of Comox Strathcona Planning Department. The boundaries of the Hague Lake / Gunflint Lake proposed park were digitized per the CIFC. Intact forest landscapes contain a full natural array of ecosystem types and have a successional pattern through time that is tied to unpredictable natural disturbance regimes. Such natural landscapes are fully occupied by plants, animals, micro-organisms, water, nutrients, and energy. Extensive modification of these landscapes results in degradation, loss of ecological integrity, and, if human perturbations are persistent, in ecological collapse. Scientists and planners now recognize the need to maintain, protect, and/or, where necessary, restore a framework of ecosystems throughout the landscape to ensure connectivity and ecosystem functioning at all scales, from the small patch or stand to the large landscape. Some human uses may also be expected to occur in selected portions of the protected landscape network. For example, hiking trails, built and used to ecologically responsible standards, may be designated in various portions of the protected landscape network. Elements of a protected landscape network should not be confused with large protected areas, parks, or wilderness reserves. Large protected areas are required throughout the landscape to provide reservoirs of fully functioning ecosystems and the biological blueprints required to reestablish functioning in landscapes degraded by human activities. The economics of the proposed protected landscape network do not need to be negative for the local economy. On Cortes, tourism employment and economic opportunities are possible within protected areas, within portions of the protected landscape network, and throughout areas of stable terrain. A high quality environment is known to benefit a broad selection of small and home-based businesses. Maintaining a healthy ecosystem requires landscape level planning and balanced human uses based on ecologically responsible standards. In coastal landscapes, the commercial and sports fisheries are also critical components of an ecosystem based economy. These fisheries depend upon the protection and maintenance of fully functioning forests that provide the creek habitat and water quality required by fish. 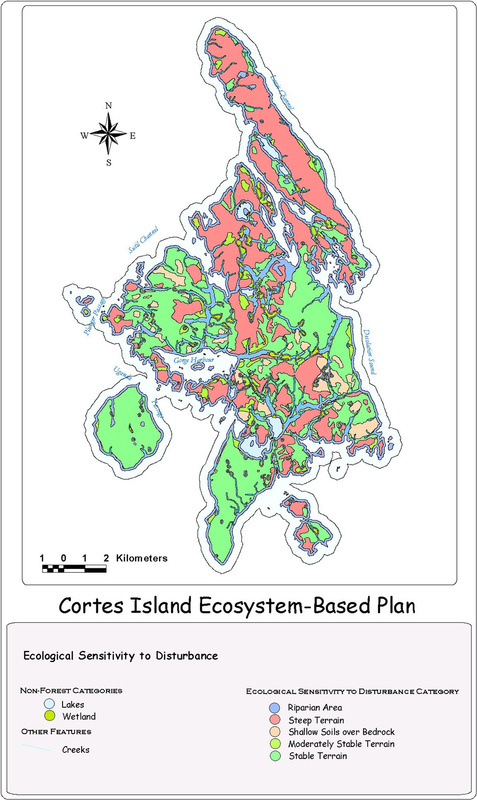 Elements from the previous maps were combined to create a map of areas unsuitable for development on Cortes Island. Because the design of the map is to remove areas from the landbase that are not suitable, anything that remains, displayed in white, may be suitable for ecologically sustainable forest management. Before any cutting would take place, each of these areas would need to be assessed at a stand level to determine if any ecological, cultural, or community functions that they serve may have been overlooked in the landscape analysis.